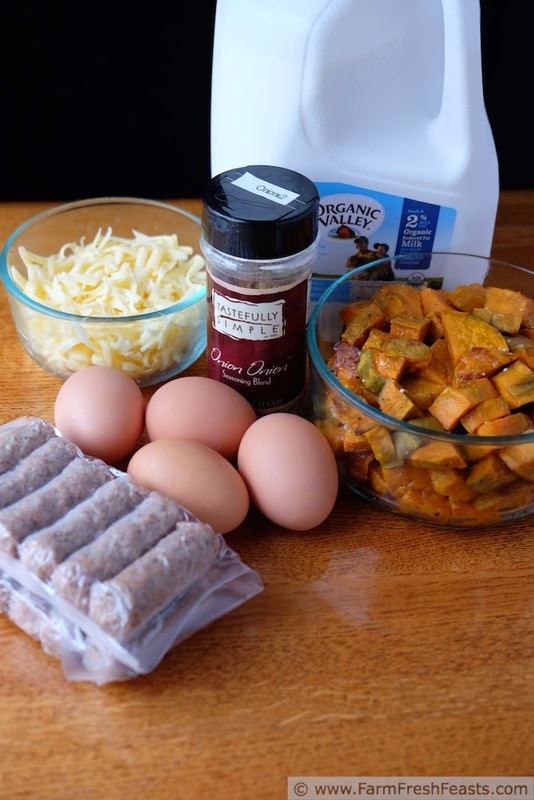 A gluten free breakfast casserole full of hearty roasted sweet potatoes and turkey sausage topped with gouda cheese. No need to assemble the night before and take up space in the fridge--this throws together fast and goes straight into the oven. I get so much mileage out of having roasted vegetables on hand. Each week as I empty the Community Supported Agriculture (CSA) farm share box into various locations around the house--the refrigerator for the greens and most vegetables, tomatoes on the counter, and potatoes, onions, and winter squash in the Strategic Winter Squash Reserve--I plan a time to roast some veggies just to have them standing by. Usually I'm roasting beets, knowing that eventually I'll find a way to use them. I hope. This time, however, I knew I wanted to have blobs of color [note to self that will be left in the post--really, blobs? maybe something more appetizing?] in a breakfast casserole so I roasted a mess of sweet potatoes as well. I roast my sweet potatoes by peeling, cubing, tossing with a teaspoon or so of olive oil and spreading them in an even layer on a piece of parchment paper on a rimmed baking sheet. I put them into the oven, turn it on to 400 degrees Fahrenheit, and let them go about 20 minutes. After that I stir them, then roast in 10 minute increments (usually just one increment) stirring each time the timer dings until they are tender. Depending on the size of the cubes, they are done in 30 to 40 minutes. These keep overnight in the fridge. 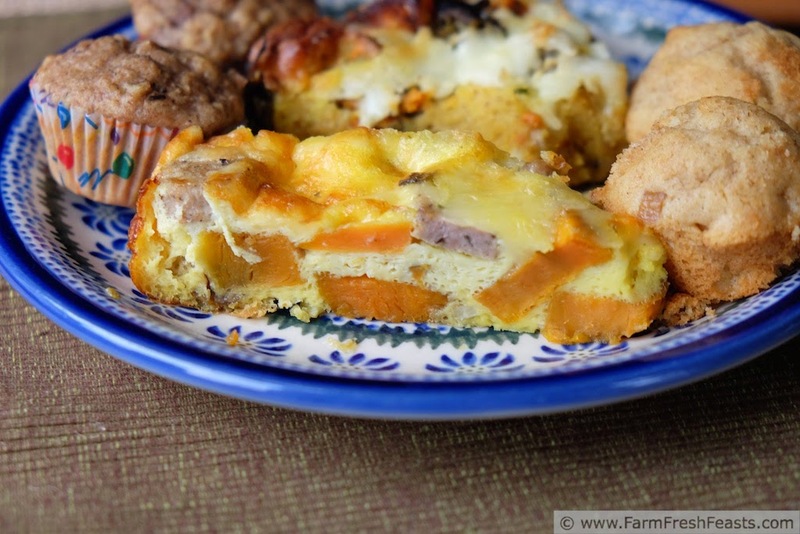 This breakfast casserole is not really a 'make ahead' type. I have a hard time finding room in my fridge for those pans anyway. There is no bread to soak--it is naturally gluten free. I didn't want to wake up, peel, and roast sweet potatoes and then assemble the casserole before my book group arrived. It was easier to get the sweet potatoes prepped while dinner was in the oven and pop them in to roast since I already had the oven on. Using precooked sausage links meant that it was simple to dump everything in the baking pan, top with cheese, pour the eggs over top, and slide into the oven. The pan, not me. I'm too big for my oven. I've got a vegetarian (and also gluten free) version of this casserole coming up later. I'm sharing this recipe now because a Costco store is opening up in my neck o' the woods this week (I bought both the turkey sausage and the gouda cheese at Costco) and because I think it would be great to serve guests over the holidays. How do I shop at Costco if there hasn't been one near me for the past 3.5 yrs we've lived in Ohio? Sled hockey! October through March my son has hockey practice Monday nights an hour away from our home. One of the things you just deal with in disabled sports, I suppose. I find ways to enjoy the outing--like shopping at the Costco or Cincinnati Asian Market that are located a few minutes from the rink. I'm glad to have a closer source for my Costco staples April through September though. For other recipes using sweet potatoes, please see my Sweet Potato Recipe Collection. Note: the first time I made this casserole, as a test recipe for the family, I used an 8 inch square glass baking dish. We were hungry, we all had seconds, and there were no leftovers. I'll share the ingredients for both an 8 inch and a 10 inch square baking pan and suggest that the 8 inch pan serves 4 to 6 people and the 10 inch pan serves 8 to 12 people, especially alongside other items. Preheat oven to 400 degrees Fahrenheit. In the square baking pan of your choice, layer sweet potatoes and sausage. 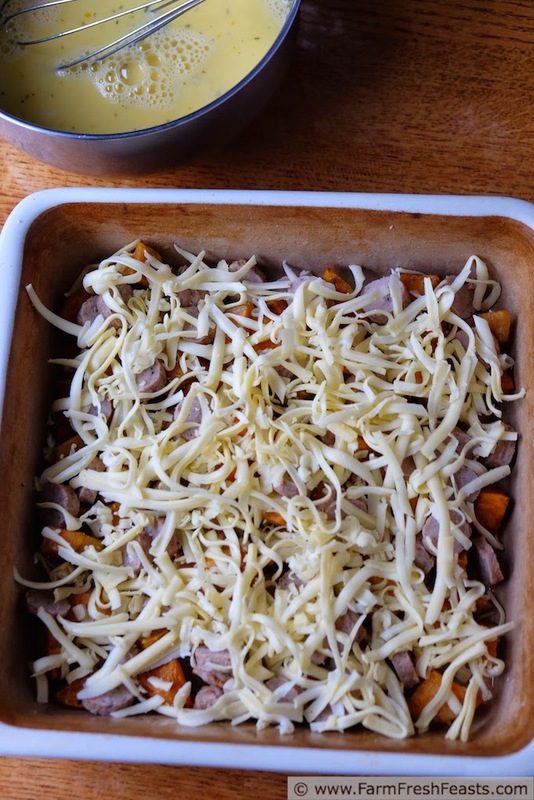 Top with cheese and set aside. In a large measuring cup or a bowl, whisk together eggs, milk, seasoning and olive oil. Pour over cheese. Bake for 30 minutes (8 inch) to 45 minutes (10 inch) or until the casserole is puffed and browned at the highest points. It will deflate slightly after you remove it from the oven. This looks so fantastic!! 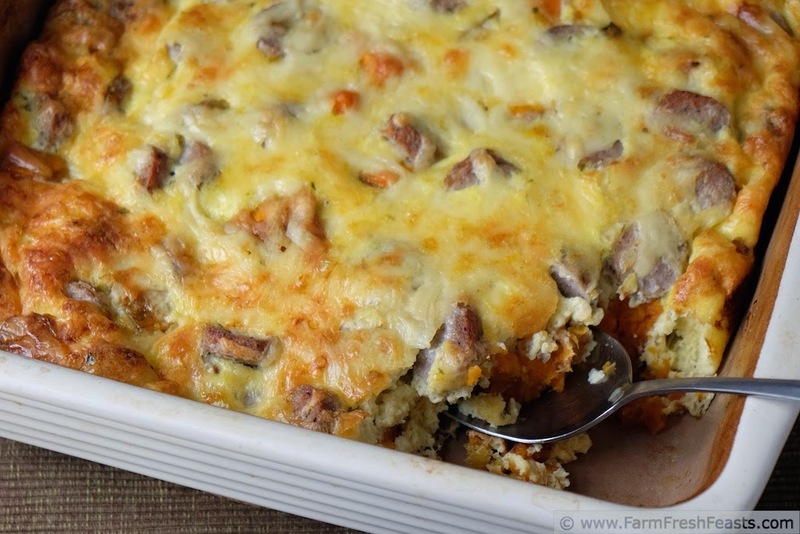 All of my favorite things in a simple casserole for my favorite meal! This would be perfect for Christmas morning, especially if you've got a full house. Thanks! I hadn't thought of it, but you're right--this would be terrific for Christmas morning. All you need to store in the fridge are the roasted sweet potatoes (well, and the eggs and the sausage) so no space jockeying. I'm so focused on overnight sticky rolls (and having enough folks to justify making a pan full of them!) that I forget about the proteins. I'm fascinated by using the potatoes right in the breakfast casserole along with the eggs. The idea never occurred to me, but you can bet I try it with my next batch of roasted potatoes. I always make enough for leftovers. I wish I knew why all these ideas occur to me. It's probably because I'm walking all these dogs. Maybe you should walk the cats and see what flows into your mind. Or not. This looks so good! My tummy is growling just looking at it. Love using seasonal foods! I have a hankering for that casserole right now. Of course it doesn't help matters that I just got back from walking all the dogs so I'm hungry in general. When my kids had practice far away, I made a point often to find places to shop that I normally wouldn't get to too. Why waste the time? 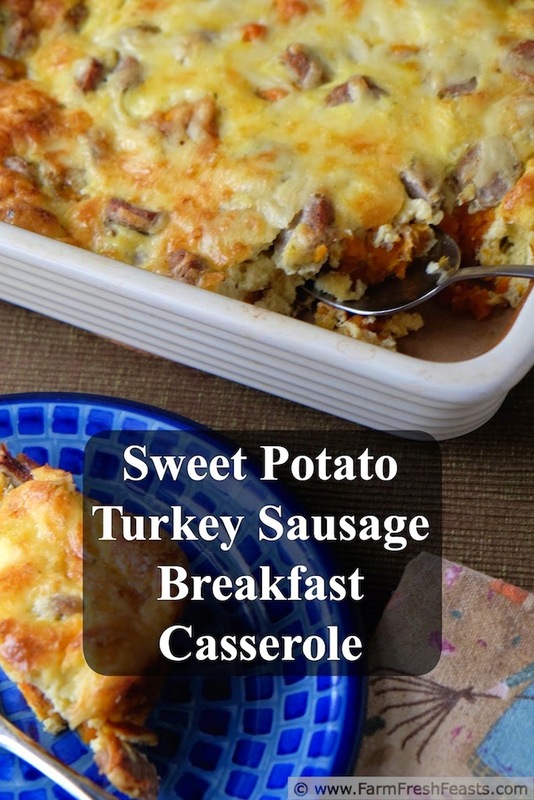 Your breakfast casserole looks deliciious...I love the ideas of using sweet potatoes! You're absolutely right. We're stuck there anyway, might as well make the most of it! This was simply amazing! I would have never put these ingredients together, but they marry so beautifully! It was very easy! I cut and roasted the sweet potatoes the night before, and while they were roasting I cut up the sausage, gouda into cubes(couldn't find shredded gouda) and cubed a couple of slices of onion,instead of the minced onion. I refrigerated it all over night and quickly assembled the casserole in the morning! I will definitely be using this recipe again! Thank you!